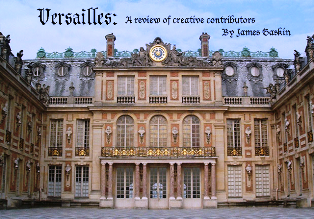 Versailles is a History game set in the Versailles Palace in France. King Louis XIV has invited you to his palace to meet all his friends. These friends include all the notable figures of the era. In the Versailles you will find many Artists, Musicians, Writers, Royalty, Clergy, Revolutionaries, Reformers, and Scientists. Listen to various composers as you collect art and music and discover who is who in Versailles. Iconoclast is a scrolling shooter game in which you are a fighter pilot whose mission is to free America from the invasion of the evil Emoticons! Shoot down oncoming Emoticons, collect powerups, and buy upgrades. 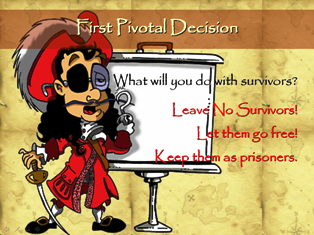 The Dread Pirate Roberts is a choose-your-own-adventure game that resembles a lot of business case studies I've read as a university student. In this game you'll get hired on as the new captain of the pirate ship Revenge. As the new captain, you'll have to make pivotal decisions which will lead you and your crew down different paths of success or failure. This game was made with Microsoft PowerPoint. If you do not have PowerPoint, you can use a free viewer by clicking here: download free ppt viewer. 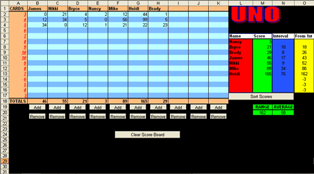 Uno ScoreKeeper is one of my first kreations. I play Uno with my family every time we get together. I was always the one to keep score. I was constantly bombarded with questions like, "Who's in first? How far behind am I? What order are we in? How many points do I have to get in order to beat so and so?" This, on top of just keeping score, made things very difficult. So I made an Uno ScoreKeeper to do the job for me. It keeps track of everyone's score, adds them up, sorts them in order -- first to last--, shows how far behind each person is from the person ahead of them, shows how far each person is from first, shows the average score, and shows the range of the scores. All in all, VERY USEFUL! Phase10 ScoreKeeper came about for the same reason as the Uno ScoreKeeper. 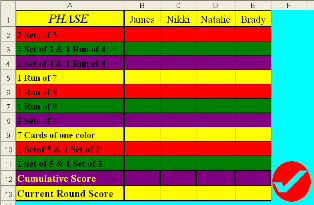 Not as cool as Uno ScoreKeeper, but still useful if you don't want to have to try and remember what phase each person is on.